…if I had not been with my Regiment when it went into action I should have regretted it all my life. Captain Godfrey’s second lieutenant, Selah R. H. Tompkins, was a young twenty-six year-old that had been with D troop since transferring to the regiment from the 7th Infantry four years earlier. Reared in a military family, Tompkins was a tough young officer, the son of Colonel and Brevet Brigadier General Charles H. Tompkins of the Quartermaster Department. Tompkins, as the final 7th Cavalry officer called on to testify on 9 January 1891 at Major General Miles’s investigation into the Wounded Knee affair, provided the following account of his actions at Wounded Knee. I was on duty with my Troop D, 7th Cavalry, on the 29th of December 1890. I had a detachment of 12 men of D Troop, 7th Cavalry, and about 5 or 10 minutes after the firing began the Troop was deployed on the crest of a hill, dismounted. I was ordered down to the ravine to the left to hold the ravine and stop the Indians from firing into the rear of our line as they had been doing. There were a number of the Indians in the ravine; my men killed three bucks that I know of. While we were engaged under fire there, some of the men remarked “Lieut., they are firing at us from that wagon” (pointing to a wagon about 400 yards to our left and front). I am not positive, but think my men fired two or three shots at the wagon, and no further trouble was given from that direction. I did not go near the wagon and do not know what was in it. While in action at the ravine, a party of squaws and children ran up the ravine not over 100 yards from my men. I immediately gave the order don’t fire on women and children, and to the best of my knowledge not a shot was fired at them. Behind them, 25 or 30 yards from them, came two bucks stripped and painted, and my men killed these. Generally speaking, men and women were so mingled together that it was impossible to destroy the bucks without endangering the women and children. This at the first break, but while in the ravine we took particular pains not to fire on women and children. Writing in a letter to his father, Lieutenant Tompkins provided additional details that indicated the two casualties in D Troop at Wound Knee occurred in his small detachment guarding the ravine, “Capt. Godfrey was with the troop when the fight commenced and I was with him shortly after. I was detached with twelve or fourteen men and had quite a little time. My men killed three bucks and I had one man killed [Private Frank T. Reinecky] and one wounded [Wagoner George York]. The bullets flew thick but I was not touched.” Tompkins provided more personal details to his mother who inquired of him about a tale she had heard that her son’s hat was shot through. You said in one of your letters you heard I had a bullet through my hat. Well, I did not stop to find out. I think my hat was shot off my head just as I was riding up to the skirmish line, but we were under quite a heavy fire at the time, and I didn’t have any time to pick up my hat, so I went through the fight without it. There was one Indian who seemed to have a grudge against me, for he fired five or six shots from his Winchester, and they all came uncomfortably close to me. He was stripped and painted in the most approved style, and as he was about 50 yards from me when he commenced shooting I had a good look at him. As the aforesaid Indian was trying to hit me I thought I would take a crack at him with my revolver, and I did so, but whether or not I hit him I can’t say. Anyhow, he stopped shooting and died where he stood. He was a brave man, but was out of luck. The regimental commander, Colonel Forsyth, wrote to Tompkins’ father, Assistant Quartermaster General Tompkins, assuring him that his son performed admirably in the fight, “Tom boy was with us, as you know, and his conduct reflected credit on his father, there being enough for himself and some to spare.” Captain Godfrey also wrote to Tompkins’ father expressing that his son did his duty during the course of the battle and would be a better officer for the experience. Your son has had his baptismal of fire and did splendidly. He has got good stuff in him and will make a good officer. He will now look at affairs more seriously. He said after the fight that he learned to know me better in five minutes in a critical period than he had before in four years service and that he should hereafter so conduct himself that I should never have to reprove him, that he would always do what I said. I am very happy over it for his sake. He has always been heretofore more like a boy, but always honorable and manly. I think now he will show his manly qualities in a way to call forth pride, honest pride. Colonel Tompkins responded in a letter to his son intimating his pride in his son’s conduct through the affair. My Dear Selah—I was very much pleased to get your letter. I knew you would act bravely and acquit yourself honorably. I am very proud of you. I received a letter from Capt. Godfrey in which he spoke of you very handsomely. I hope the fighting will soon be over. Give my kind regards to Gen’l Forsyth, and tell him every officer I have heard speak of this affair are on his side, and I am heart & soul. I only wish more squaws had been killed. Selah Reeve Hobbie Tompkins was born 17 July 1863 in the Nation’s capital. He was the eldest of seven children born to Charles Henry Tompkins and Augusta Root Hobbie. At the time of Selah’s birth, thirty-two-year-old Charles Tompkins was serving as a captain in the Quartermaster’s department, a position during the Civil War that enabled him to reside with his twenty-seven-year-old bride of eight months. During the first sixteen years of their marriage, the Tompkins buried three of their children: nine-month-old Charles Henry, Jr., in 1867, four-year-old Augusta Hobbie in 1876, and six-year-old George Parker in 1879. All three Tompkins sons that lived to adulthood served lengthy careers in the cavalry: Tommy retired in 1927 as a colonel with almost forty-three years in the saddle, Frank retired for disability in 1918 after thirty years of service, and the youngest brother, Daniel, also retired as a colonel in 1940 after forty-two years of service. Indeed, the military for the Tompkins men was a family tradition. 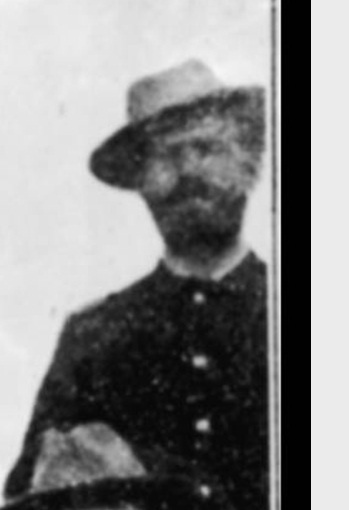 The father, Charles Tompkins, followed in the footsteps of his father, Daniel D. Tompkins, who retired in 1858 as colonel in the Quartermaster department after a thirty-eight-year career. He returned to service for two years during the Civil War operating a Quartermaster depot in New York. During his career, he received a brevet promotion to major for gallantry as an artillery officer in the second Seminole war and a brevet of lieutenant colonel for meritorious service as a Quartermaster during the Mexican war. Charles Tompkins began his career as an enlisted soldier in the First Dragoons in 1856. He was commissioned an officer at the outset of the Civil War and was cited for gallantry in one of the first engagements of the war, action for which he was awarded the medal of honor more than three decades later. He received numerous brevet promotions during and at the end of the war for gallantry and meritorious service. He retired as a colonel and brevet brigadier general in 1894. Young Selah Tompkins began his military career ingloriously when he failed the English entrance exam at West Point, purportedly following a night of hard drinking at Benny Havens’ Tavern. However, this initial setback did little to slow this future cavalryman’s career. With his father’s connections, General Philip Sheridan was able to secure a direct commission from the President in 1884, thus gaining a commission three years earlier than if he had completed a four-year course of instruction at the Military Academy. First Lieutenant S. R. H. Tompkins sporting his famous mutton chop whiskers at Fort Sill, Oklahoma, circa 1898. While campaigning in Cuba in 1902, Tommy Tompkins married Miss Dolores Muller in Havana, she being the daughter of a Spanish officer. They had six short years together during which she bore him two daughters, Augusta Maria del Carmen and Dolores. The latter died in April 1908 two days after she was born, and the mother two days after that. Tompkins never remarried and raised his daughter who married Lieutenant Richard C. Singer in 1922. Colonel Selah R. H. Tompkins, 7th U.S. Cavalry, mounted. Twelve years later Tompkins passed away in 1939 from stomach cancer. The New York Times ran a fitting obituary of the grizzled cavalry Colonel and icon of the Seventh. SAN ANTONIO, Texas, Feb. 6, (AP).–Colonel Selah R. H. (Tommy) Tompkins, famed cavalryman of the old school, died at the Fort Sam [Houston] Hospital last night. Colonel Tompkins, whose luxuriant beard and rough talk and demeanor became a tradition during forty-three years of service in the United States Army, retired from active duty July 17, 1927, on his sixty-fourth birthday. 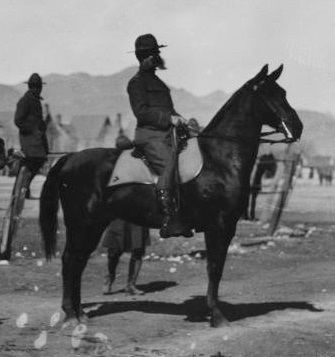 All but six years of Colonel Tompkins’s army life were passed with the Seventh Cavalry and when it came time to retire a special War Department order was issued sending him back from Fort Stanley, Texas, which he then commanded, to have his last week with the outfit in which he arose from “shave-tail” to colonel. Colonel Tompkins was born in Washington, D. C., the son of the late General Charles Tompkins and a member of a family that had contributed many officers to the United States Army. In 1900 [sic: 1890] he rode with the Seventh against the Sioux Indians in the battle of Wounded Knee. He rode again with his famous cavalry unit when it accompanied General Pershing into Mexico on Villa’s trail. He received a silver star citation then. During the World War he led the Seventh in its border patrol work and in training men for overseas duties. 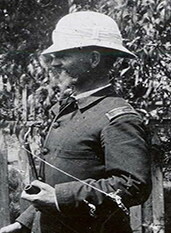 In 1916 Colonel Tompkins attained the rank with which he retired in 1927. Toward the end of the World War he was in command of the Second Brigade. To cavalrymen his name meant action. He was the stuff of tradition and anecdote. His gift for expletive wrought him a sort of immortality. The colonel still believed with the dictionary that the word cavalry meant “mounted troops.” He strongly opposed motorizing cavalry units. Once in the Philippines, old soldiers recalled at Fort Sam Houston tonight, he was given 400 cavalry recruits and told to mold them into a fighting unit. After a few weeks his superior officer sent a note inquiring how things were going. He had two brothers, Colonel Frank Tompkins, retired, and Colonel Dan D. Tompkins, stationed at Atlanta. His son-in-law, Captain R. C. Singer, is stationed in Hawaii. Colonel Tommy Tompkins was a bit of a poet and a couple of years after the fight at Wounded Knee, he penned an ode titled “The Dragoon Bold.” The closing stanzas would serve as a fitting farewell to the horse-cavalry officer more than forty-five years later. And he longs to hear the trumpets blast. And whose motto is, Well, everything goes! 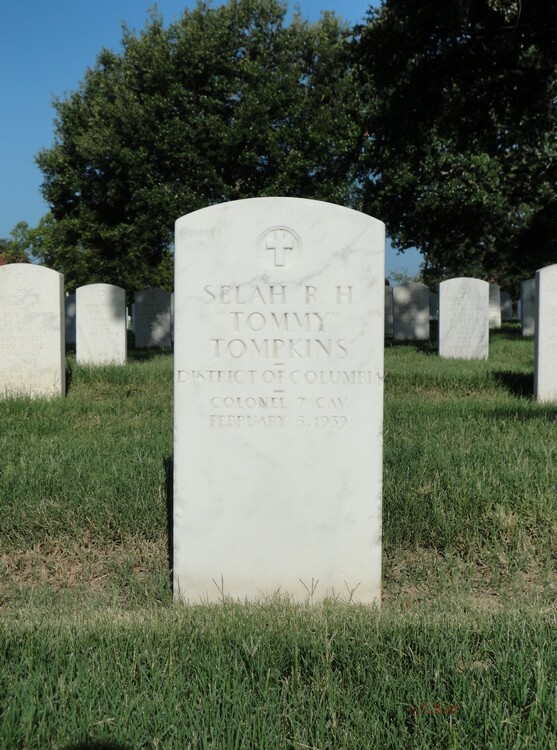 Colonel Selah R. H. “Tommy” Tompkins is buried at the Fort Sam Houston National Cemetery. His wife, Dolores Muller, and infant daughter are buried at the Fort Riley Post Cemetery. John M. Carroll, “TOMPKINS, SELAH REEVE HOBBIE [TOMMY],” Handbook of Texas Online (http://www.tshaonline.org/handbook/online/articles/fto37), accessed May 22, 2014. Uploaded on June 15, 2010. Jacob F. Kent and Frank D. Baldwin, “Report of Investigation into the Battle at Wounded Knee Creek, South Dakota, Fought December 29th 1890,” in Reports and Correspondence Related to the Army Investigations of the Battle at Wounded Knee and to the Sioux Campaign of 1890–1891, the National Archives Microfilm Publications (Washington: The National Archives and Records Service, General Services Administration, 1975), Roll 1, Target 3, Jan. 1891, 697-698. Selah R. H. Tompkins, letter to Colonel Charles H. Tompkins, Carroll, as quoted by John M. Carroll in The 7th U.S. Cavalry’s Own Colonel Tommy Tompkins: A Military Heritage and Tradition (Mattituck, N. Y.: J. M. Carroll & Company, 1984), 74. Selah R. H. Tompkins, letter to Mrs. Augusta Root Hobbie Tompkins, Carroll, Colonel Tommy Tompkins, 76. James W. Forsyth, letter to Colonel Charles H. Tompkins, Carroll, Colonel Tommy Tompkins, 76. Edward S. Godfrey, letter to Colonel Charles H. Tompkins, Carroll, Colonel Tommy Tompkins, 73. Charles H. Tompkins, letter to Lieutenant Selah R. H. Tompkins, Carroll, Colonel Tommy Tompkins, 74. Edward S. Godfrey, letter to Colonel James W. Forsyth, Carroll, Colonel Tommy Tompkins, 77. James W. Forsyth, letter to Major General John M. Schofield, Carroll, Colonel Tommy Tompkins, 77. Ancestry.com, United States Federal Census [database on-line], Provo, UT, USA: Ancestry.com Operations Inc, 2006, Year: 1880, Census Place: Saint Paul, Ramsey, Minnesota, Roll: 630, Family History Film: 1254630, Page: 22D; Enumeration District: 001, Image: 0046; Samuel L. Russell, “Family Group Sheet of Charles Henry Tompkins and Augusta Root Hobbie,” Cavalry Officers of the American Frontier, (http://trees.ancestry.com/tree/16731112/family/familygroup?fpid=20144031048) accessed 25 Jul 2014. Historical Data Systems, comp., U.S., Civil War Soldier Records and Profiles, 1861-1865 [database on-line], Provo, UT, USA: Ancestry.com Operations Inc, 2009. Carroll, Colonel Tommy Tompkins, 68. United States Federal Census, Year: 1910, Census Place: Fort Riley Military Reservation, Geary, Kansas, Roll: T624_440, Page: 3A, Enumeration District: 0060, FHL microfilm: 1374453; Year: 1930, Census Place: Fort Ethan Allen, Chittenden, Vermont, Roll: 2428, Page: 10A, Enumeration District: 0028, Image: 76.0, FHL microfilm: 2342162. Aultman, Otis A. [Colonel Selah R. H. Tompkins]. The Portal to Texas History. http://texashistory.unt.edu/ark:/67531/metapth63159/. Accessed July 25, 2014. Carroll, Colonel Tommy Tompkins, 85, 92, 95, 100, 107, and 112. Associated Press, “Obituaries,” New York Times, Feb. 7, 1939. Carroll, Colonel Tommy Tompkins, 127-128. LKat, “Selah Reeve Hobbie Tompkins,” FindAGrave (http://www.findagrave.com/cgi-bin/fg.cgi?page=gr&GRid=93947330) accessed 5 Jun 2014, uploaded 30 Jul 2012. 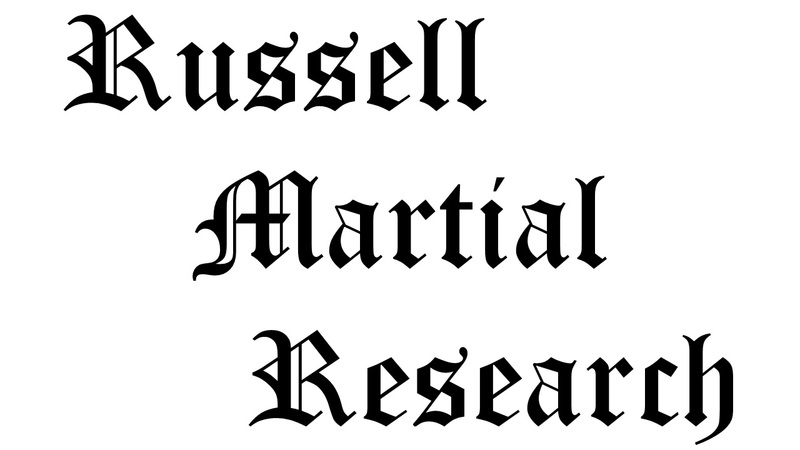 Citation for this article: Samuel L. Russell, “Second Lieutenant Tommy Tompkins, D Troop, 7th Cavalry,” Army at Wounded Knee (Sumter, SC: Russell Martial Research, 2013-2014, http://wp.me/p3NoJy-uk), posted 25 July 2014, accessed date __________. This entry was posted in Officers, Wounded Knee Investigation and tagged 1890, 1891, 7th Cavalry, 7th Cavalry Regiment (United States), Cavalry, ghost dance, Pine Ridge, Pine Ridge Agency, Pine Ridge Indian Reservation, Pink Whiskers, Tommy Tompkins, Wounded Knee, Wounded Knee Creek, Wounded Knee Massacre. Bookmark the permalink.